No matter how you are feeling on any given day — you find what you go looking for. So be careful what you go looking for!! Sometimes we go looking for trouble — and we find it (think cupcakes or suze q’s). Trouble with a Capital T! Sometimes we go looking for sympathy — and we find it (either in the form of a friend who builds us back up, OR in the form of a partner in crime who can take our crime from a misdemeanor , ie an accidental cookie or two, to a felony, ie a weekend of endless, mindless eating. We’re always looking for something. As human souls, we are Seekers. We go looking for our purpose, we look for our companions, we look for our meaning, we look for fun, distraction, comfort……it’s endless. Sometimes it’s “the Seeking” that is so delicious in life…..surpassing “the Finding” far and away. Spend some time this week, being mindful about what you seek in life. Is it productive? Or destructive? 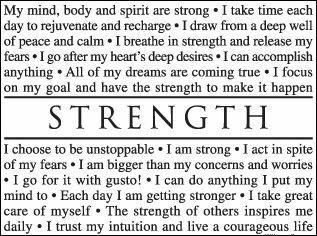 Are you seeking affirmations that support your strength? Or are you looking for Proof of old thoughts that are holding you back? Try this exercise today. Close your eyes. Clear your mind. Allow yourself to Seek out One Word, just One Word, — a word that defines you AND makes you smile. Smile bigger than you have smiled in a decade. What is your word? For me – today – it was Strength. I want it. I want to BE IT. I want to Be Strong. Once you have your word — go out to Google, and type your word into the Search Bar — Select Images, and hit Go. In front of your eyes, should be, hundreds of pictorials of Your Word that Defines You. Find One, and Print it, Post it, FaceBook It. Fall in Love With It. Let it Become Part of You. Invest in Your Word, Your Visual You. When you do, I think you will find that you naturally start working toward it, being pulled forward by it. Forward momentum stars to build, and it has the Power of a freight train, if you feed it and let it roll. And when you get tired of the image, cuz we are human souls, and we grow tired of sameness…..so when you get tired of it. Do it Again. Pick the same word, or a new one. Go Seeking, and Find Food for Your Soul that Guides You Forward. I went looking for my Strength today — And I found it. My Instructions to myself are: Read – Believe – Do! And Repeat! There are SO many things here that are DELICIOUS to me. “I breathe in strength and release my fears”. Oh man. I’m going to turn that one into a meditation phrase. I Love it! “I choose to be unstoppable”. D@mn straight I do. “Each day I am getting stronger”. I think if I choose to believe in that one….it will come true one day at a time. So, I went Seeking today. Not for suze q’s, that was Sunday (ugh). No, I went Seeking for my Strength, and I found it. Now I’m going to spend some time cuddling it, and falling in love with it. Time invested in Believing in Myself….well, that’s where the Magic Happens.